All information posted within the interfolio client Community is only available to users who have been provided credentials and are logged into the system. 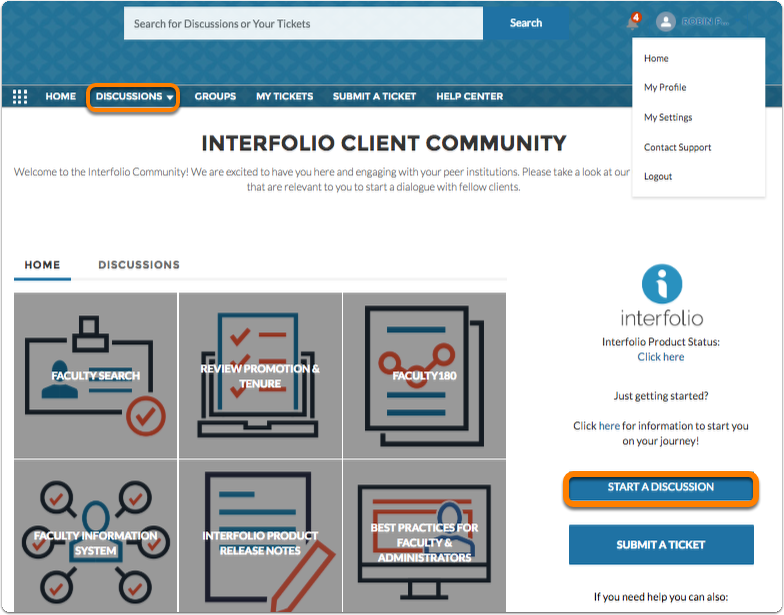 Only institutional administrators have access to the Interfolio Client Community. 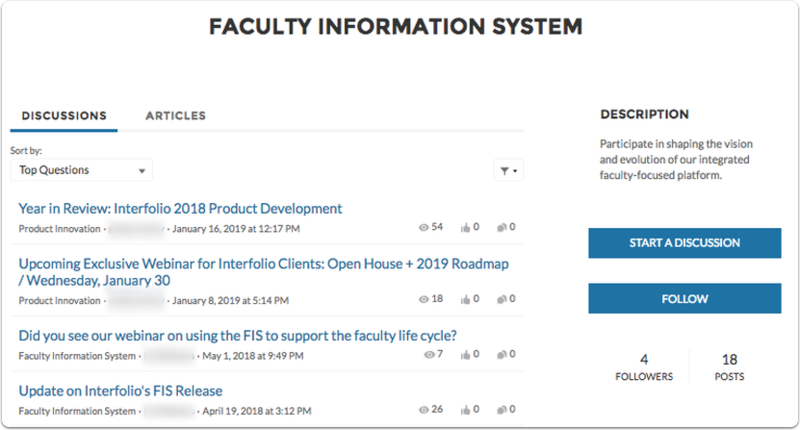 We at Interfolio want to encourage our institutional clients to participate in an ongoing discussion on our products and realize our goal of becoming the premier faculty information series. Additionally, we want you to be able to learn from the best practice of other clients who are trying to accomplish similar tasks as you. With this cross-institutional collaboration, we hope you can provide the most effective process to capture and use the data you capture at your institution. 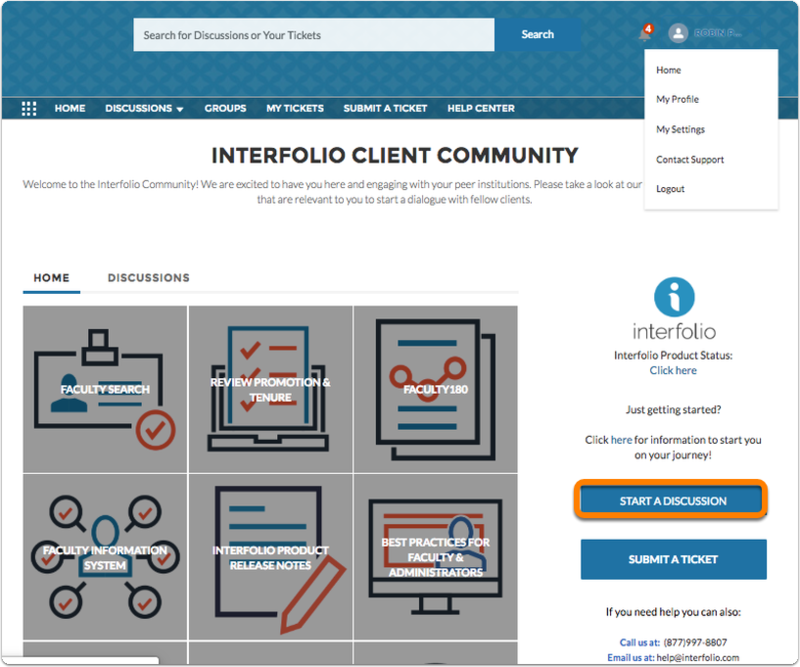 There are many ways to participate in the discussions within the Interfolio Client Community, below are just a few ways to engage with all Interfolio Client Community Users. Before posting always search for an existing or ongoing discussion thread. Type in the relevant information or keywords into the discussion bar at the top of the screen. Each posting will display the topic, the date posted, the number of likes, and the number of responses. 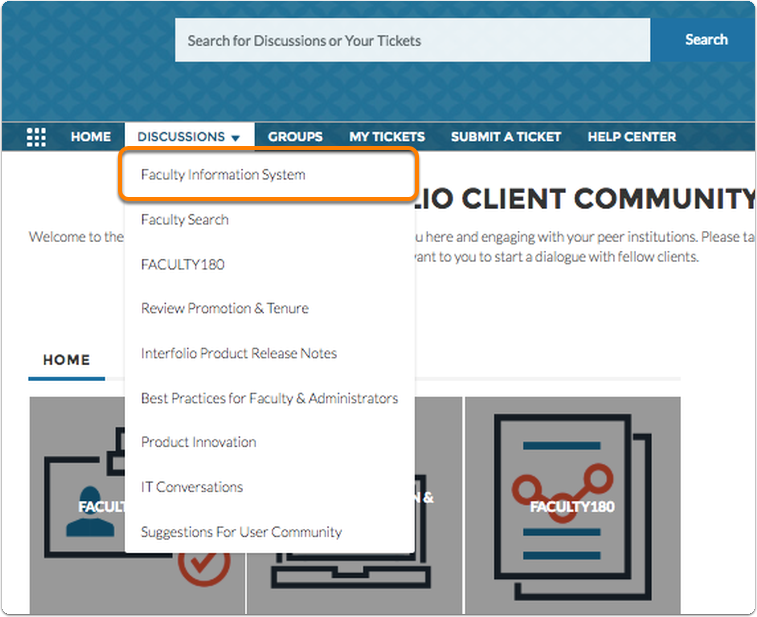 Or dive into the subject areas and browse the existing discussion threads, by clicking the discussions drop-down field at the top of the page. Choose and existing thread to view from the subject page. Or browse through the most recent discussions from the homepage by clicking the Discussions tab. 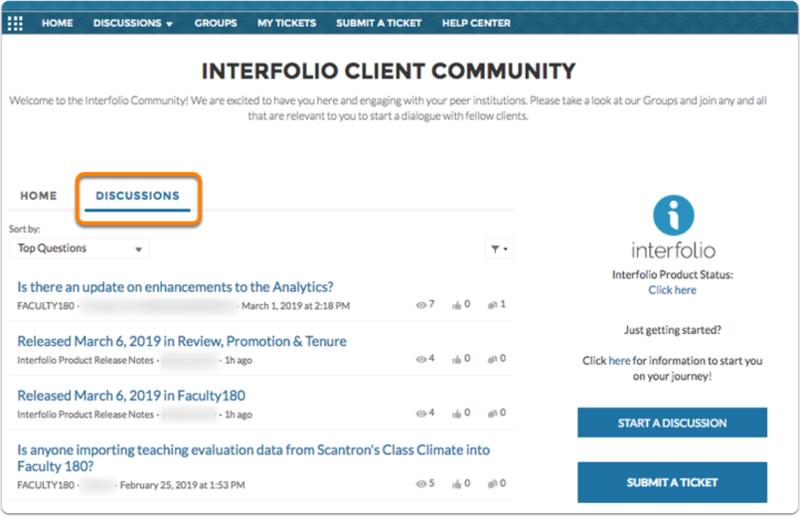 Select the Discussions button to start a new conversation within the Interfolio Client Community. 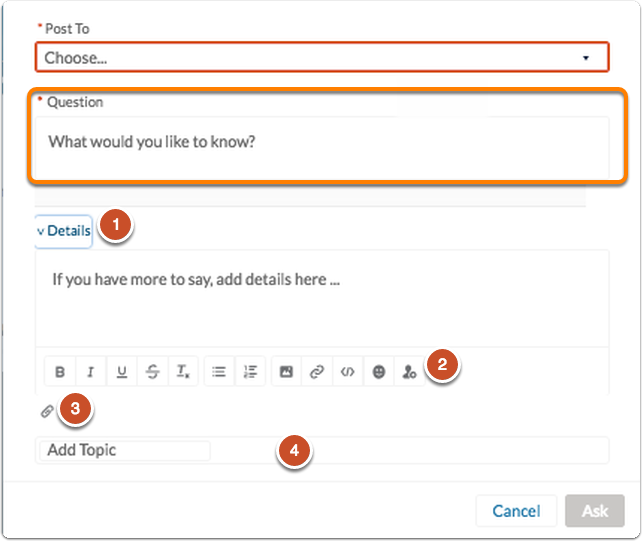 A module will pop up and ask you to choose where you would like to "Post To", or what is subject or topic of the post to categorize it within the discussion board. 1. Click to expand the details section to add more fields to your discussion. 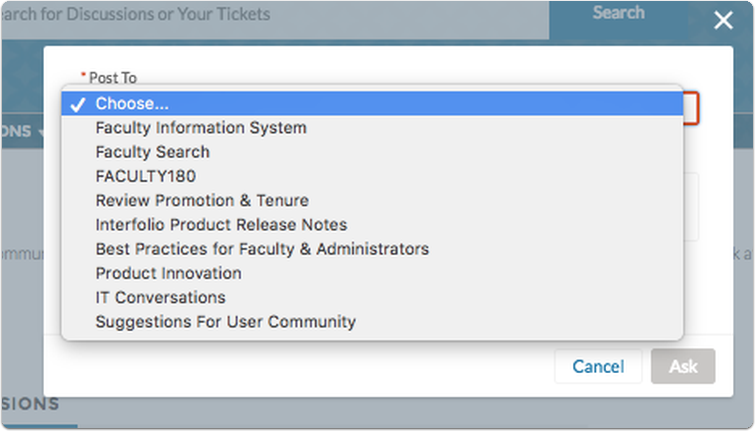 As you enter information topics will automatically be populated at the bottom of the form. 2. 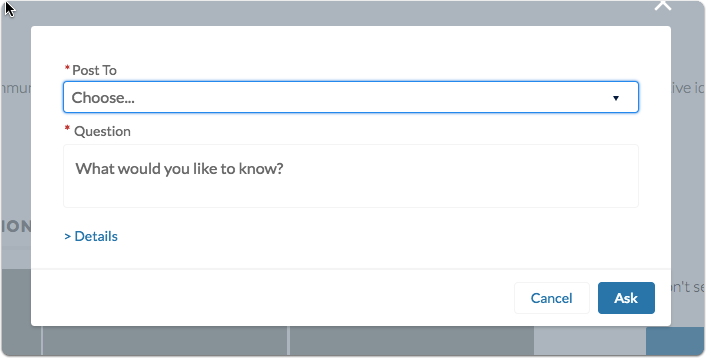 You can format, add images or emojis, or tag individuals in the toolbar below the textbox. We encourage you to get creative to be able to convey your message and engage the community. 3. Click the attachments button to add files to your discussion posting. Collaborate and share information to help get inspiration for new and more effective processes. 4. As you enter information into the posting, topics will automatically be populated at the bottom. You can also manually add your own topics. This will help people search and filter to find your discussion. After posting you can contribute to your posting again to participate in the conversation, you can delete the posting, or you can add additional topics. if your notifications settings allow, you will be notified of all contributions to your posting, unless you mute from within the posting, then you will no longer be notified. 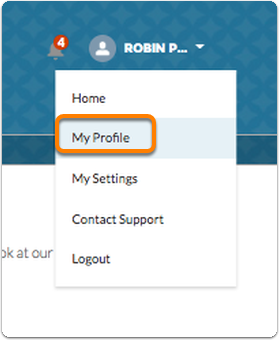 It is very easy to view all of your previous posting within the Interfolio Client Community, simply use the user menu in the top right part of the screen. Making sure that 'Feed' is selected, you can then view all of your posting and relevant threads at the bottom of your profile page. Users can search and filter by this page.